Anil Ambani led Reliance Group (Anil Dhirubhai Ambani Ventures Limited) has crossed Rs 1 lakh crore market capital as share prices of all companies within this group has risen sharply in the last few weeks. As per the latest figures shared by Bombay Stock Exchange, the total market capital of the 4 companies listed under Reliance Group now stands at Rs 1,01,832 crore, which is an increase of 100% compared to last year when it has touched low of Rs 50,000 crore. 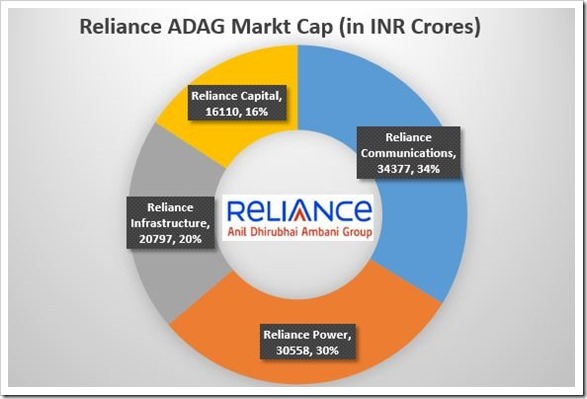 Among the 4 listed companies, Reliance Communications is at #1 rank with a market capital of Rs 34,377 crore, followed by Reliance Power at Rs 30,558 crore; Reliance Infrastructure at Rs 20,797 crore and Reliance Capital at Rs 16,110 crore. In total, market capital of all the companies listed in BSE is now standing at Rs 92 lakh crore. If compared, then Tata Group with a market capital of Rs 8 lakh crore is ranking #1 among all companies, followed by HDFC Group with a market capital of Rs 3.7 lakh crore and Mukesh Ambani led Reliance Industries with market capital of Rs 3.35 lakh crore. On one hand Anil Ambani’s Reliance Group is enjoying 100% increase in market capital since last 12 months, there is a bad news for 37% of its 15,000 strong work force. In order to reduce debt and increase profits, Reliance Group has decided to lay off 6000 of its employees (15% workforce) by the end of July. As per reports coming in, Reliance Group is all set to outsource it’s call centers and shared services operations, thereby taking a bold “restructuring” decision. Insiders are claiming that this decision to outsource call center operations will result in profitability increase and by removing shared services employees, the company is now focusing only on core business operations, thereby optimizing resource utilization, which will help in increased revenues. We have come to know that Reliance Group is already in talks with 2 third party call centers, and looking forward to a multi-year deal worth Rs 700 crore, which will result in direct elimination of 6000 employees from Reliance’s payroll. Out of 6000, around 4500 employee are currently working in their call centers and the rest are involved in shared services division. Rs 200 crore per year would be saved by eliminating these 6000 employees. As of now, Reliance Group is under a debt of Rs 34,000 crore due to huge expenditures in acquiring higher bandwidth and expansion of their telecom network. Recently, Reliance Group has made a commitment to reduce their debt by Rs 20,000 crore by end of March, 2016, and besides laying off employees, they are also considering selling their real estate properties and devising strategic monetization method from their existing assets. "Anil Ambani led Reliance Group Achieves 1L Cr M-Cap, To Lay Off 6000 Employees", 5 out of 5 based on 1 ratings.